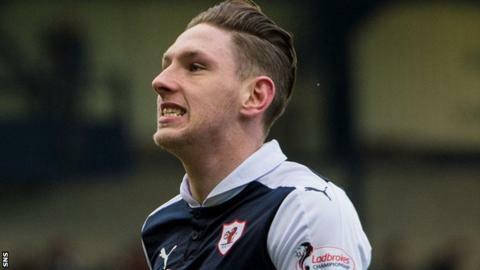 Raith Rovers face a Scottish Championship relegation play-off despite a battling win over Ayr United. Declan McManus struck in the last minute to earn 10-man Rovers victory. Jonathan Court, for Raith, and Ross Docherty, for Ayr, had scored either side of half-time. St Mirren's draw at champions Hibernian consigned Rovers to a play-off semi-final clash with Brechin City, while the Honest Men finish bottom of the table, and are automatically relegated. John Hughes' side made the worst possible start when goalkeeper Pavol Penksa was shown a red card for a foul on Craig Moore. But with Conor Brennan in goal, Raith went ahead eight minutes before the break when Court fired home from the edge of the box. Ayr got themselves back on level terms with 20 minutes to go, with Docherty's effort from outside the box finding the net. Brennan saved Alan Forrest's penalty before McManus scored the winner with time running out. Match ends, Raith Rovers 2, Ayr United 1. Second Half ends, Raith Rovers 2, Ayr United 1. Attempt missed. Declan McDaid (Ayr United) left footed shot from outside the box is close, but misses the top left corner. Attempt saved. Farid El Alagui (Ayr United) header from the centre of the box is saved in the centre of the goal. Attempt missed. Declan McDaid (Ayr United) right footed shot from the centre of the box is just a bit too high. Corner, Ayr United. Conceded by Kyle Benedictus. Corner, Ayr United. Conceded by Ross Matthews. Goal! Raith Rovers 2, Ayr United 1. Declan McManus (Raith Rovers) right footed shot from the centre of the box to the high centre of the goal. Jonathan Court (Raith Rovers) wins a free kick in the attacking half. Foul by Daryll Meggatt (Ayr United). Corner, Raith Rovers. Conceded by Nicky Devlin. Corner, Ayr United. Conceded by Conor Brennan. Attempt saved. Declan McDaid (Ayr United) left footed shot from outside the box is saved in the bottom right corner. Attempt blocked. Daryll Meggatt (Ayr United) right footed shot from outside the box is blocked. Foul by Daniel Handling (Raith Rovers). Jonathan Court (Raith Rovers) wins a free kick in the defensive half. Hand ball by Daryll Meggatt (Ayr United). Foul by Jonathan Court (Raith Rovers). Nicky Devlin (Ayr United) wins a free kick in the attacking half. Penalty saved! Alan Forrest (Ayr United) fails to capitalise on this great opportunity, right footed shot saved in the bottom right corner. Iain Davidson (Raith Rovers) is shown the yellow card. Penalty conceded by Kyle Benedictus (Raith Rovers) with a hand ball in the penalty area. Foul by Declan McManus (Raith Rovers). Substitution, Raith Rovers. Ryan Hardie replaces Jason Thomson. Attempt missed. Alan Forrest (Ayr United) left footed shot from outside the box misses to the left. Attempt blocked. Gary Harkins (Ayr United) right footed shot from outside the box is blocked. Attempt missed. Brian Gilmour (Ayr United) left footed shot from outside the box is high and wide to the left. Goal! Raith Rovers 1, Ayr United 1. Ross Docherty (Ayr United) right footed shot from outside the box to the bottom right corner. Assisted by Patrick Boyle.